The Instant Pot manual that you wish had come with the Instant Pot. An easy-to-use beginner’s guide with lots of step-by-step photos to get you started. 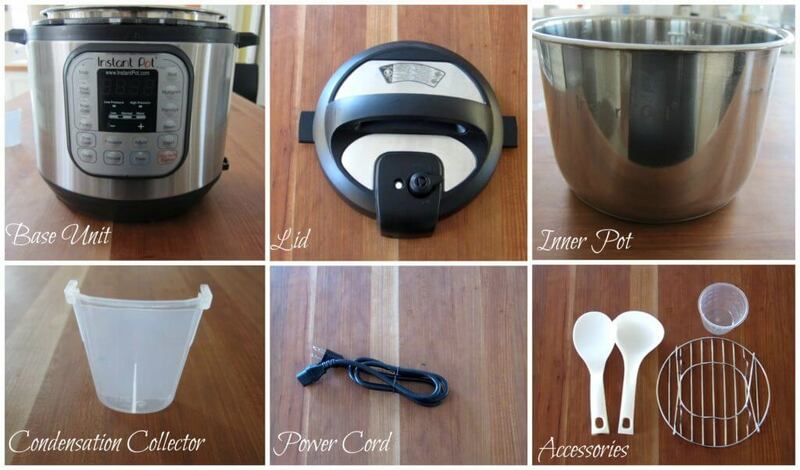 This guide shows you all parts of the Instant Pot, how to assemble it and use it (video included). It also walks you through how to do the water test (video included). 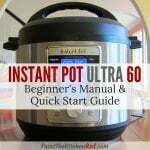 If you own an Instant Pot ULTRA, please read the Instant Pot ULTRA Beginner’s Manual and Quick Start Guide. January 2018 Note: the images in this post have the ‘Manual’ button. Newer models of the Instant Pot have the same function, but it’s been renamed to ‘Pressure Cook’. I just became an Instant Pot convert and I can’t believe it took me so long to get one! 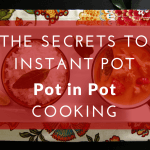 If you just bought an Instant Pot and are ready to start using it or if you already own one but are too intimidated by it, you’ve come to the right place. In this easy-to-understand Instant Pot manual, I’m going to give you a quick introduction to the Instant Pot and its parts, and I’ll show you how to use the Instant Pot. You know how when you buy a new computer, it comes with a Quick Start guide? 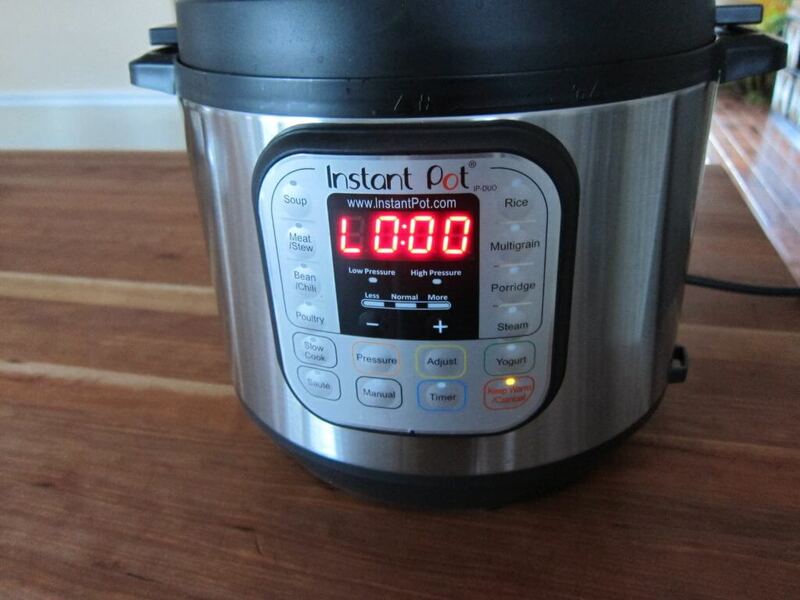 Well, think of this as a Quick Start guide that will get you going and make you comfortable using the Instant Pot. 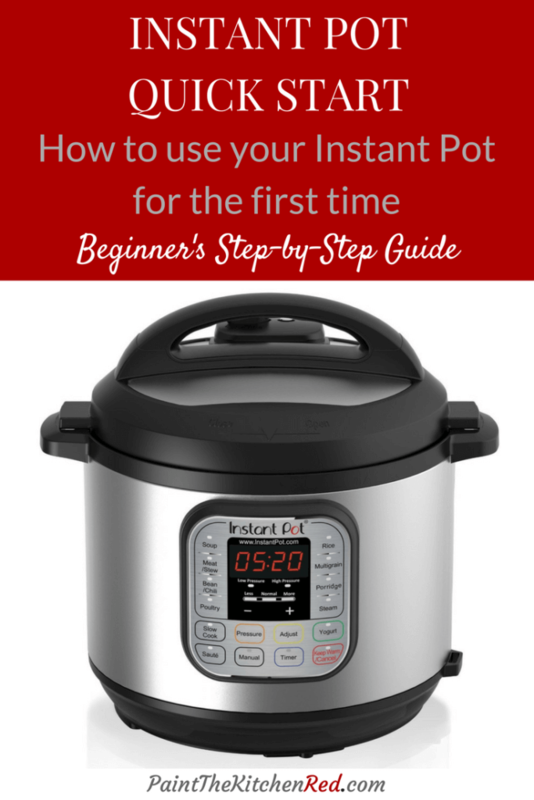 When I first got my Instant Pot, I have to admit that it was a bit scary! So many buttons, so many features, and the Instant Pot manual that came with it wasn’t always that clear. At least to me. 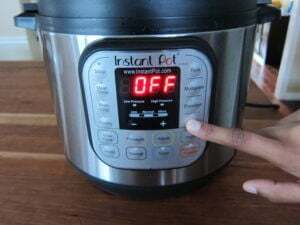 So today I’m going to give you an overview of the Instant Pot so that you’ll know how to use the Instant Pot for first time without being scared of it! If you’re more of a visual person, like me, you might have an easier time following this Instant Pot manual with photographs. This is the Instant Pot manual you wish had come with your Instant Pot! 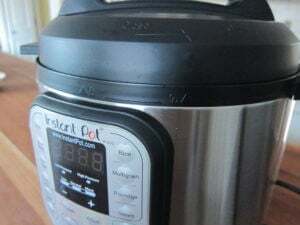 Those of you who aren’t yet on the Instant Pot bandwagon may ask “What the heck is an Instant Pot?” Well, it’s this wonderful new appliance that can be used as a pressure cooker, slow cooker, rice cooker and much more – the convenience is amazing, I just love it. The Instant Pot that I bought from amazon is the Instant Pot IP-DUO60 7-in-1 Multi-Functional Pressure Cooker. The 7 functions are: Pressure Cooker, Slow Cooker, Rice Cooker, Saute/Browning, Yogurt Maker, Steamer & Warmer. I used to have a stove-top pressure cooker. Oh my, what a difference! No need to babysit the pressure cooker any more. And it’s not loud like my old pressure cooker. 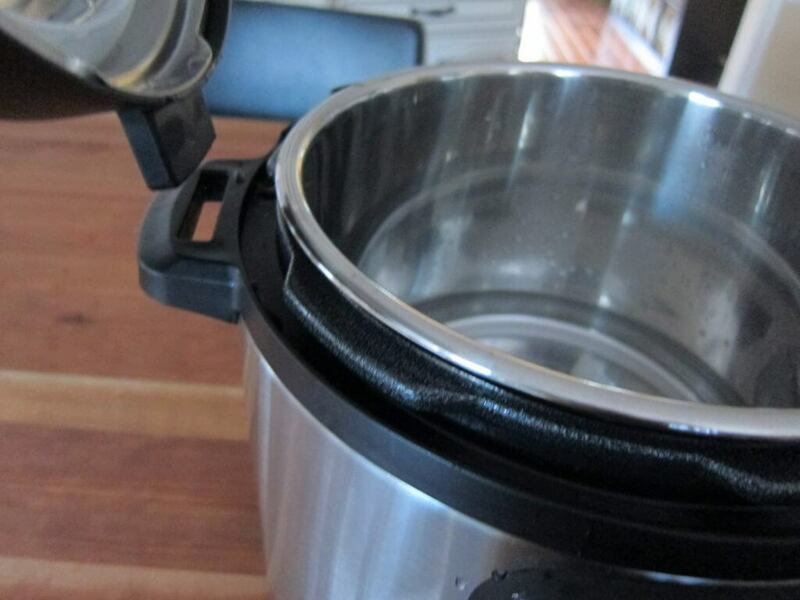 When I was a kid, my mom’s pressure cooker once exploded (!) and there was turmeric-colored dal (lentil soup) all over the ceiling and walls!! I shudder just thinking about it. No need to worry about such scary things with the Instant Pot. It has lots of safety features including automatically regulating pressuust put the ingredients in it and leave the house and dinner’s ready when I get home. Rice in 5 minutes, boneless chicken breasts in 10 minutes, bone-in chicken in 15 minutes. You can also set a delay timer and have the cooking start later on. Added bonus – I get so much cabinet space back; got rid of my pressure cooker, slow cooker and rice cooker! 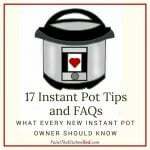 You might find these posts to be helpful also: 16 Reasons Instant Pot is not Sealing and 17 Instant Pot Tips and FAQs. If you want more technical and detailed information about the Instant Pot, you can also visit the Instant Pot website. 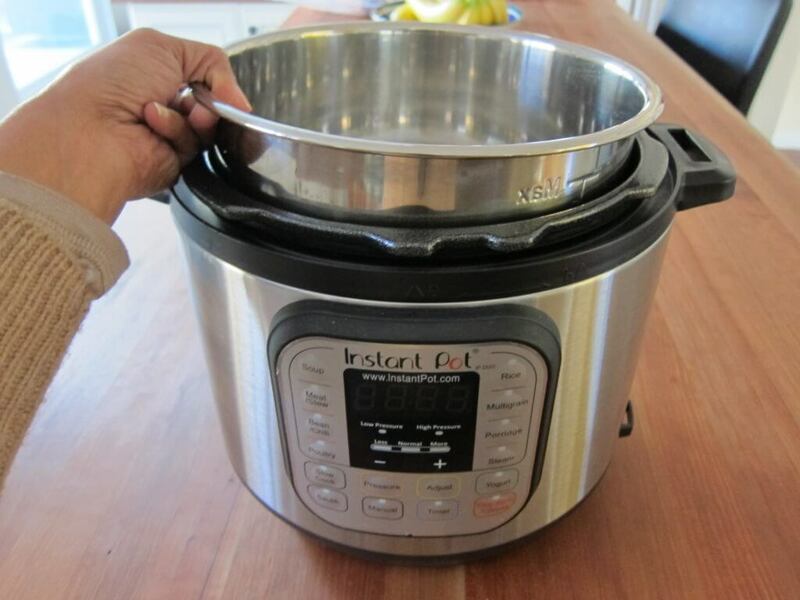 In this post, I’ll just be going over the basics of how to use the Instant Pot: assembling the Instant Pot and doing the water test. Just get you going! The Instant Pot ships with these parts: base unit, lid, inner pot, condensation collector, power cord, measuring cup, trivet, utensils. 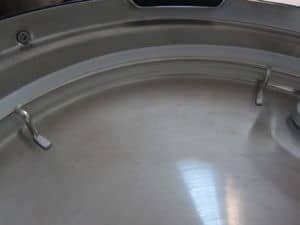 Once you take the Instant Pot out of the box, you’ll place the stainless steel inner pot into the base unit. Next you attach the power cord. 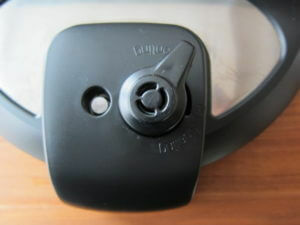 The outside of the lid has a steam release handle. 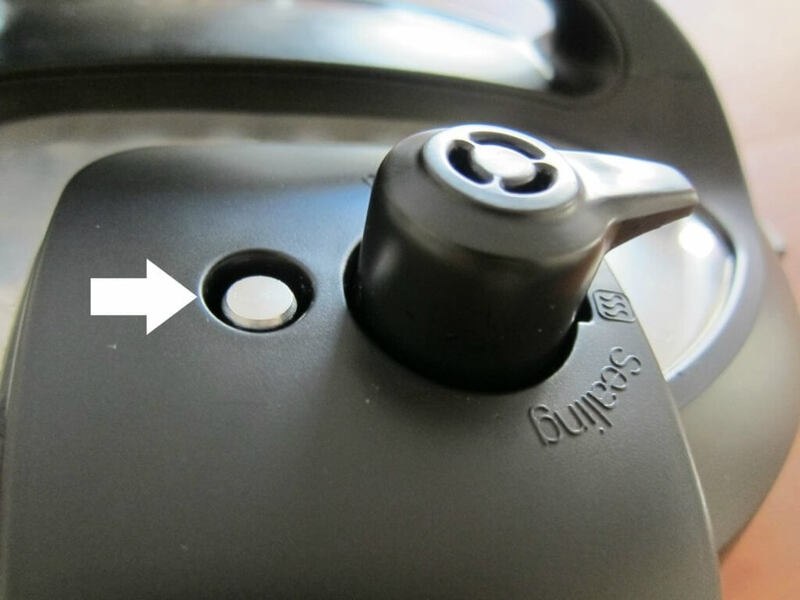 The steam release handle needs to be in the ‘Sealing’ position unless you’re using the slow cooker functionality or you are releasing steam manually, which we’ll talk about later on. Try and push the float valve up and down from the inside of the lid. The float valve will be in the down position when the Instant Pot is not pressurized. That’s how you know it’s safe to open the Instant Pot. And the float valve is in the up position when it is pressurized. This means you cannot open the Instant Pot until the pressure drops. 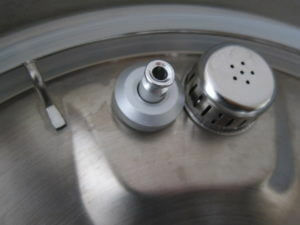 The inside of the lid has the float valve (on the left) and the anti-block shield (on the right) which protects the exhaust valve. You’ll need to know how to remove the anti-block shield to clean the exhaust valve. I found it hard to remove the anti-block shield with my bare fingers. But when I used a silicone flexible trivet and pushed it with my thumbs, it came off really easily. You could probably use a microfiber towel or a silicone jar opener too. The float valve may also need to be removed to be cleaned. Just take off the silicone cover and remove the float valve. To replace, just put the float valve back in and push the silicone cover back on. The sealing ring sits in the sealing ring rack and can be removed for cleaning. Don’t pull on it with too much force, or it can be stretched. When replacing the sealing ring, make sure it’s securely seated in the sealing ring rack. You’ll know it’s seated properly if you can turn/rotate it, with a bit of effort. 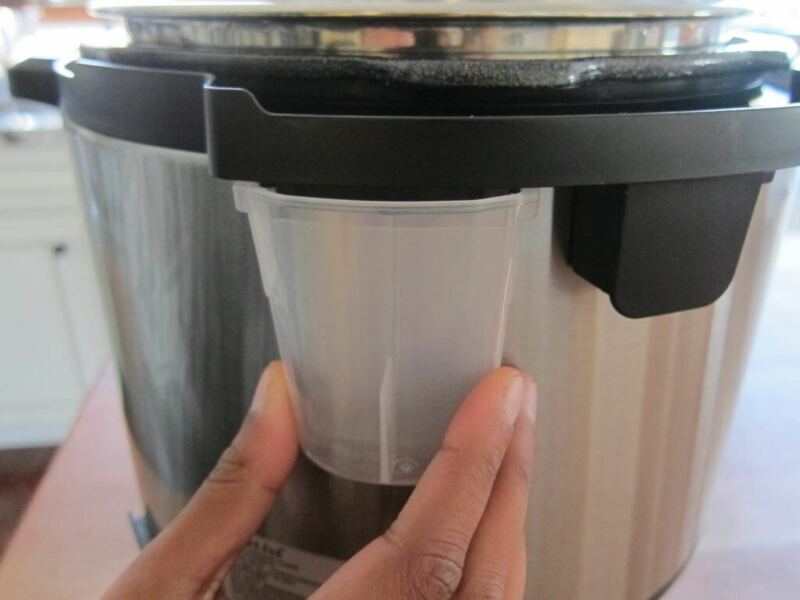 If you don’t put it back in correctly, the Instant Pot won’t seal and your food won’t cook. Trust me, I learned the hard way! 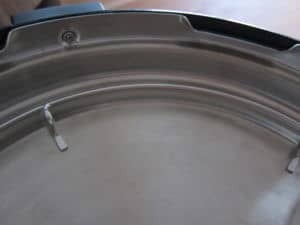 To close the Instant Pot, place the lid on the base unit and line up the arrow on the lid with the “Open” (image of an open lock with an arrow) on the base. Turn the lid clockwise until the lid arrow lines up with the “Close” (an image of a closed lock with an arrow) on the base. You’ll hear a chime. 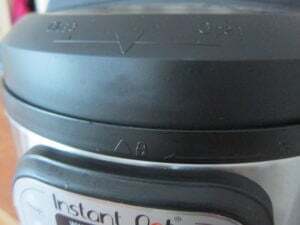 To open the Instant Pot, turn the lid counter-clockwise until the arrow on the lid lines up with the “Open” arrow on the base. Again, you’ll hear a chime. To keep the lid open, insert the right or left lid fin on the lid into the notch in the handle of the base unit. You’re now ready to use your Instant Pot! The best way to start out is to do the ‘Water Test’. 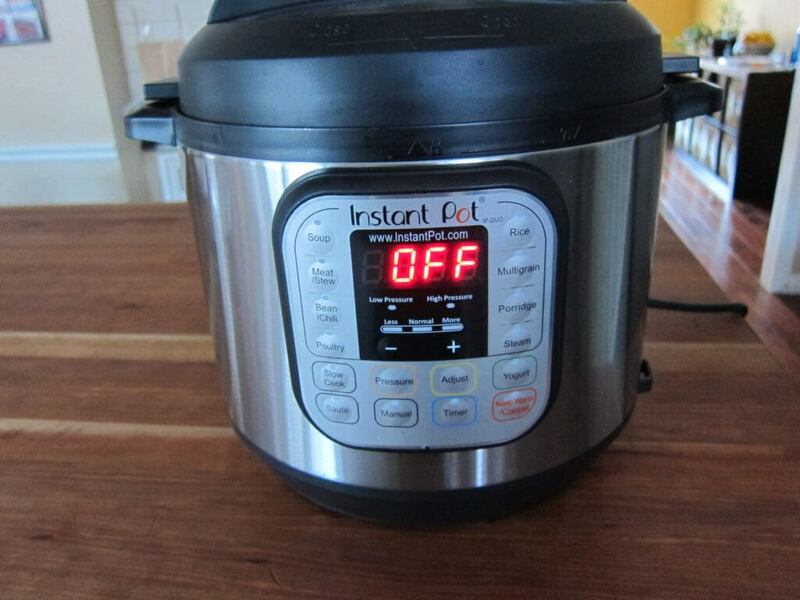 It’s just a way to make sure your Instant Pot is not defective and to get you familiar with the controls. 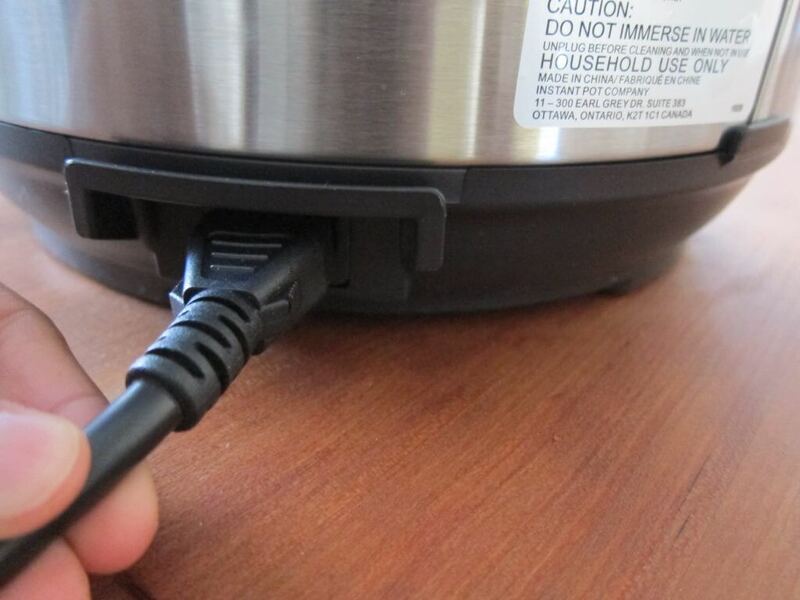 Plug in the Instant Pot and make sure the steam release handle is in the “Sealing” position. Add Water: Make sure the inner pot is seated in the base unit of the Instant Pot. Pour about 3 cups of water into the inner pot. 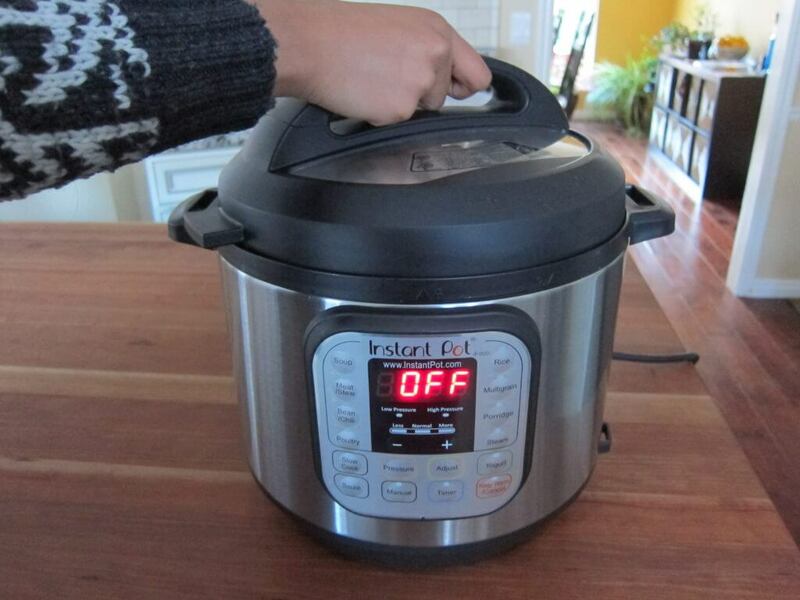 Close the Instant Pot: Put the lid on and close it by turning clockwise. You’ll hear the chime. Steam for 2 minutes: Press “Steam” on the control panel and set the time to 2 minutes by pressing the (-) / (+) button till the display reads ‘2’. Pressurizing: The display will read “On” until pressure is reached. 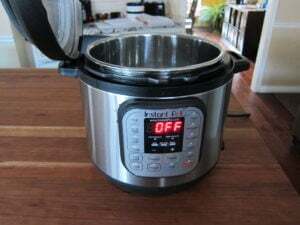 Once the Instant Pot is pressurized, the float valve will be in the up position and the display will show the time remaining (starting at 2 minutes and counting down). Total time can be about 5 or 6 minutes. You might notice a funny, plastic smell. Don’t worry – it should go away and shouldn’t happen again. Cooking complete: Once the 2 minutes have elapsed, the Instant Pot will beep and go into the Keep Warm mode. The display will show “L0:00” which will be a count-up timer telling you how long it has been since it has been in the Keep Warm mode. So if you cooked something and left the house, the Instant Pot will stay on Keep Warm mode for up to 14 hours. The float valve is up, so that means the Instant Pot is pressurized. You won’t be able to open it. You can either allow the steam to release naturally (Natural Release) or you can manually release the steam (Quick Release.) 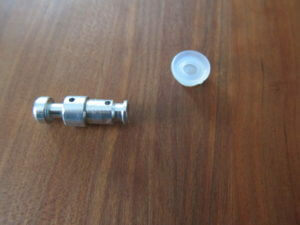 For Natural Release, just wait for the float valve to go to the down position on its own. This can take 10 to 30 minutes. 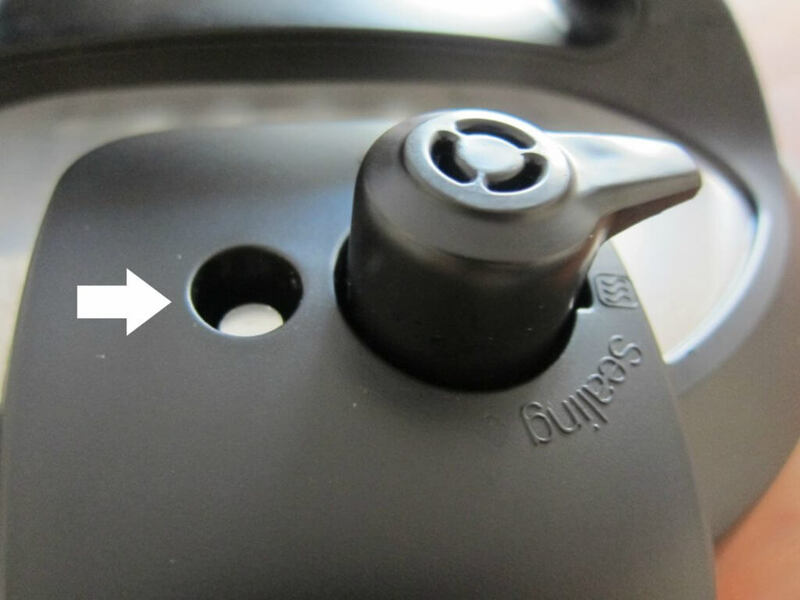 For Quick Release, you need to move the pressure release handle from ‘Sealing’ to ‘Venting’ position. The steam can burn you, so be sure to keep your face and hands away from the steam. I like to place a folded towel over the sealing handle and move it to the venting position. 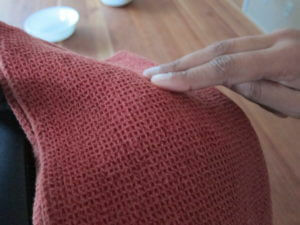 Remove the towel once you’ve turned the handle, so that it doesn’t obstruct anything. 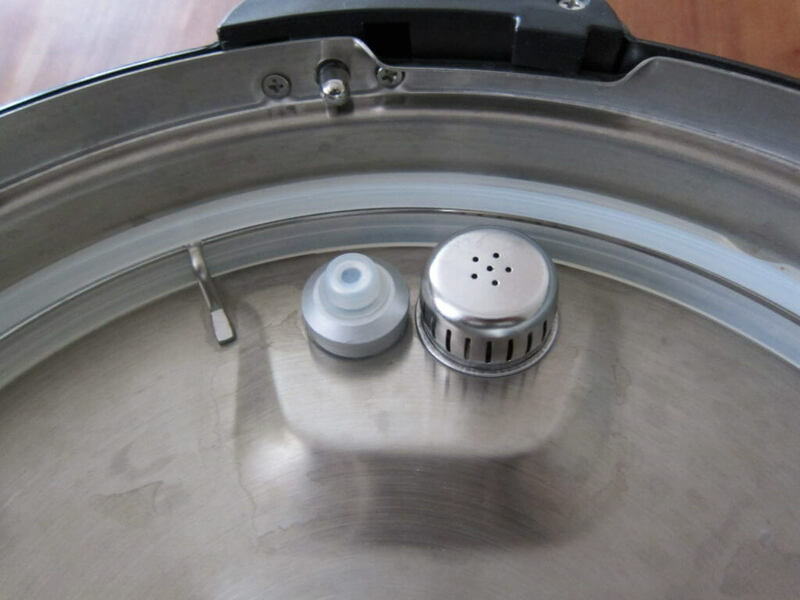 When your Instant Pot is depressurized, the float valve will be in the down position. Open the Instant Pot by turning the lid counter-clockwise so the arrow on the lid lines up with the “Open” arrow on the base unit. You’ll hear a chime. Lift the lid and tilt it slightly so the water drips into the Instant Pot. Place the lid fin in the lid fin slot to prop the lid open. There you have it! 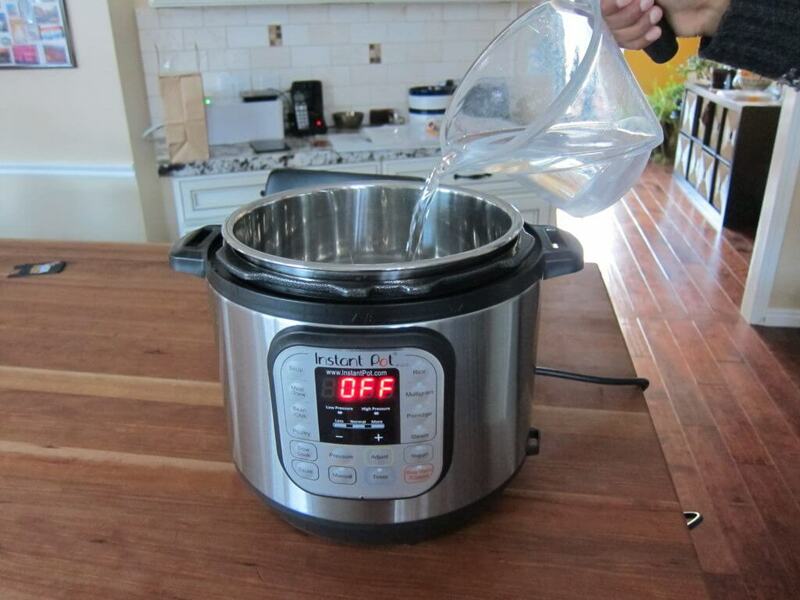 I think you’ve figured out how to use your Instant Pot, because you’ve just cooked your first “dish” in the Instant Pot – water! I hope my version of the Instant Pot manual and Instant Pot instructions were helpful to you. For your first recipe, I suggest that you start off simply by making either Instant Pot Basmati Rice using Pot-in-Pot Method, Instant Pot Jasmine Rice, or Instant Pot Hard Boiled Eggs. Then you can try out your first recipe. Here’s a tip for you: don’t try to improvise or wing it with your first recipe. Select a recipe from a trusted Instant Pot or Pressure Cooker cookbook or blog, and follow the recipe as written. If you want to make changes or adjustments, you might want to contact the blogger or ask for advice from an experienced Instant Pot user. All my recipes are thoroughly tested many times and I have step-by-step photographs and Instant Pot instructions so even a beginner can follow along and make more complex recipes. I do my very best to respond to comments or emails, so you can contact me if you have any questions about a recipe or your Instant Pot. Please subscribe to the newsletter to get notified when a new recipe is published. And let me know in the comments or through my Contact Page if you’d like to see any particular recipes or cuisine. chart for the instant pot. I am going to be making a quick vegetarian chili in the pot with different kinds of canned veggies. I was going to use the more button but wasn’t sure for how long. HELLO THANK YOU SO MUCH FOR THIS GUIDE. I JUST PURCHASED MY POT YESTERDAY SO WAS HAPPY TO DISCOVER YOUR WONDERFUL GUIDE. BELIEVE IT OR NOT I COOKED BEEF BURGERS IN MINE LAST NIGHT, MY FIRST THING I COOKED, I WRAPPED THEM IN FOIL THEY WERE DELICIOUS. SADLY MY POT DIDN’T COME WITH THE TRIVET SO I’VE HAD TO ORDER ONE FROM AMAZON. Awesome Sue! Glad you found a trivet to order – you’ll use it a lot! I’m confused on setting the timer for cooking brown rice it says 24 minutes. Is that 24 minutes after it pressures up? Or total minutes? Sasha, recipes usually just mention what you need to program the pressure cooking time to be. You would just select ‘Pressure Cook’ and 24. 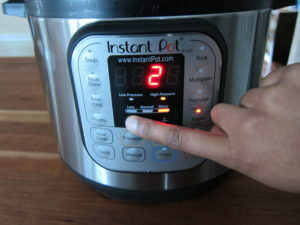 The Instant Pot will come to pressure and then the display will get set to 24 and count down to 0. 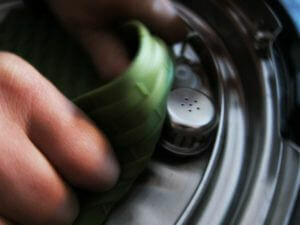 It will then go into Keep Warm mode until the pressure releases on its own or you do a quick release. Hope that helps. Thank you, thank you, thank you! 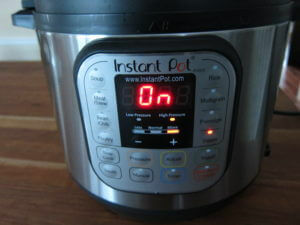 I got the InstaPot because my sister uses it all the time. When I went to get instructions she did it all for me and I was lost! 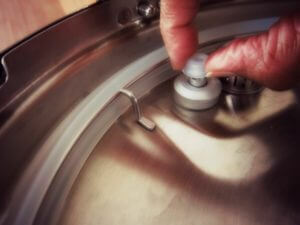 Question… Does it matter in recipes if you use the quick release or the natural release for the pressurization? Becca – you should follow the recipe release method. In general, I use quick release for foods that can get overcooked like veggies, fish, etc. I use natural release for meats that are not fully submerged in liquid. I use either for meats that are submerged in liquid like curries, preferring to use natural. There are some foods like rice where I wait for 10 minutes and then do a release of pressure, or if I am in a hurry and it’s a natural release recipe. Hi, I just got the insta pot smart wifi duo. I have been trying to put it on pressure cook but every time I try to go past 6 minutes it starts over at 0… sm i doing something wrong? The time read out looks like 6:00. And thethen if I press the plus button it starts over.. I’m confused. Thanks! Jennifer, the time on the display is hours:minutes so I think you’re doing 6 hours rather than 6 minutes. 6 minutes is 00:06. Thanks for the question and let me know if you need further help. Thank you for this guide. I bought all 3 of my daughters an Instant Pot for Christmas and am putting together a booklet for them, since they are all beginners at cooking, and will include this and a few recipes to get them started. This is very helpful. Thank you for you comment – what a nice mom and what a great gift you’re giving them – not just the IP but a plan! on the timer readout, it goes 0.0:0.0. Which are the minutes? I set what I thought was 6 minutes, the timer read 0.6:00. I was cooking spaghetti. About 30 minutes later it still had not shut off and my spaghetti noodles were mush! Going left to right, would the first 2 zeroes be hours? And the last 2 zeroes on the right be minutes? Also, on mine IP, the farthest zero on the right does not change that i’ve seen so far, it stays at zero. Sheryl, the time is displayed as hours:minutes. You were setting it for 6 hours, which is the maximum cook time. To cook spaghetti at 6 minutes, you would set it for 00:06. Hope that helps. Sorry your spaghetti became mush; I’m sure it will be perfect next time! So I have tried the water test twice now the first time all the water was gone when I stopped it, it never counted down. Trying it again and it has taken over 25 min and it still has not started the 2 min. Timer. Feeling frustrated and stupid. What could I be doing wrong its water for goodness sake. Hi Kelly, first of all, don’t feel stupid – we all went through a learning curve with the Instant Pot. It sounds like your lid is not sealing and that means that probably your pressure release valve is in the venting position or your sealing ring isn’t pushed in all the way. 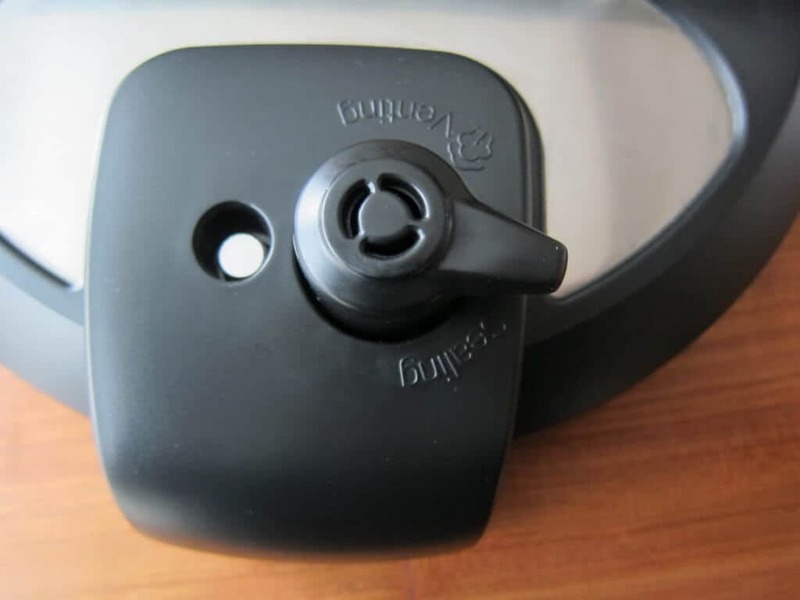 After checking those two things, check to see if the bolt under the anti-block shield on the inside of the lid is finger-tight. Try the water test again (don’t wait 25 minutes – if you have just a cup of water, it should come to pressure in about 5 to 10 minutes), and if you are still having trouble, you might want to either return it or open a support ticket at the IP company. Feel free to email me through my contact page if you have further questions – I’m happy to help. Just got my 3QT Duo Mini out of the box. Thank you for your step to step guide with pictures! Makes it really clear and easy to understand. I kept flipping the pages of the manual that seemed to be incomplete. My son-in-law gets impatient waiting for pressure to come down even when using a quick release. What he has started doing is depressing the float valve along with turning the steam valve to venting. Is this dangerous? It seems like it would be but I can’t find any information one way or the other. Elizabeth, I agree with you. I wouldn’t push down on the float valve. The float valve really doesn’t need any help going down. Once pressure is released, it should go down automatically. Thank you so much for your step by step. You showed me how to use it. Just got one for Christmas and had no clue how to use it. You have the best tutorial. Will be checking out your receipes. I got my Instant Pot for Christmas. I confess it was a bit intimidating until I found your well- written instructions. I am not new to using digital multi-use pots, having used my Cooks’s essentials and Nesco models for several years now. 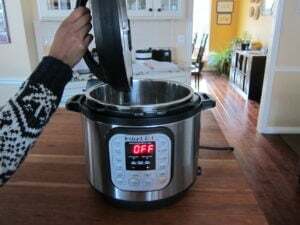 But while the CE and Nesco pots had virtually the same control panels on them for browning, pressure cooking, slow cooking, etc, the Instant Pot controls baffled me a bit. I got it all figured out but didn’t find this blog until dinner was over and the dishes washed! You cleared up a couple of details about the controls for me. Tonight we had a wonderful pot roast, carrots and potatoes, and despite some 8nitial uncertainty about the “meat” program and the + or – button for adjusting the time, my results were consistent with previous meals. One thing I think that should be pointed out in more detail is storing the unit. 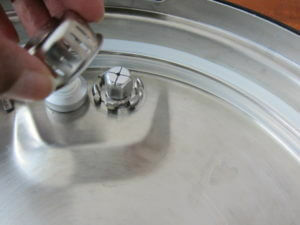 The lid should be placed UPSIDE DOWN on the unit, not gasket side down and never, ever locked. Storing this way might save a little space, but puts undue pressure on the gasket, not to mention that airing the gasket can reduce residual odors. I usually put a bit of plastic wrap over just the inside widgets to protect them from dust, but otherwise the lid is exposed to the air and not sealed up tight. Hope this helps somebody as your blog helped me. Thank you, Diane, for sharing your tips! I’m very glad you found my blog and wish you happy cooking adventures with your Instant Pot. Help, how do I turn it off? I want to slow cook on high and I pressed slow cook, then pressed adjust tried to adjust to add more time and it’s not working for me. Any thoughts? Marilyn, you press + and – to set the time. So you would press Slow Cook and then + or – and the display will change to ‘On’. You’re welcome, Barbara. Definitely, baby steps is a good strategy. Once you’re comfortable with the Instant Pot, you will be able to attempt more complex recipes. Your tutorials are phenomenal and I am in the middle of my water test! One comment – I am disappointed that my LUX Mini does not have slotted handles to prop the lid. That would have been so convenient! And one question – I want to also use mine as a slow cooker. Do you have a tutorial on this process as well as pressure cooking? Katherine, I’m glad you like the tutorials. I don’t have a slow cooker tutorial but please note that Less = warm, Normal = low, More = high. Let me know how it works for you – I’ve had mixed results with slow cooking. Thanks for your comment. Thanks, Allie – I’m glad you found it to be helpful!